With it being the holiday weekend, I thought it would be nice to make brunch for my hubby and I. The only problem is: hubby doesn’t like eggs. So bacon and eggs are out. Omelets are out. French toast is out, even with whole wheat bread for me. Pancakes! We can do pancakes! Only problem is: white flour. Wheat is something I’ve been trying to cut back on. Sure, I could splurge and have some, but I wondered if I could do something different to change it up. That’s when I remembered that I had some almond flour (meal) in the cupboard. I browsed the web and found a recipe for almond flour pancakes on the roasted root website. I thought, “Why not?” and started gathering up the ingredients for them. But what to do in the way of a topping? Corn syrup, maple syrup and pancake syrups would defeat the purpose of trying to make healthier choices in this. They’re so laden with over-processed sugars. Add all the blueberries, water, vanilla and Stevia to a medium sized pot and bring to a boil over medium-high heat. Stir in the cornstarch and lower heat to low, simmering for 2-3 minutes or until it reaches the desired consistency. Makes: about 2 cups of sauce. While the pancakes are high in fat and higher in calories than the same recipe done with white flour, the protein content is better by far, and it’s not wheat that I’m eating. The pancakes themselves were quite nice. They’re not the sweet-tasting kind we’re used to. Hubby said that they have a nice nutty flavour (for obvious reasons) and we both felt that they were rather ‘light’ in texture. I found four made a nice plate for brunch, with the fresh blueberry sauce made for a more sophisticated pancake brunch than we’re used to. We both thoroughly enjoyed this! 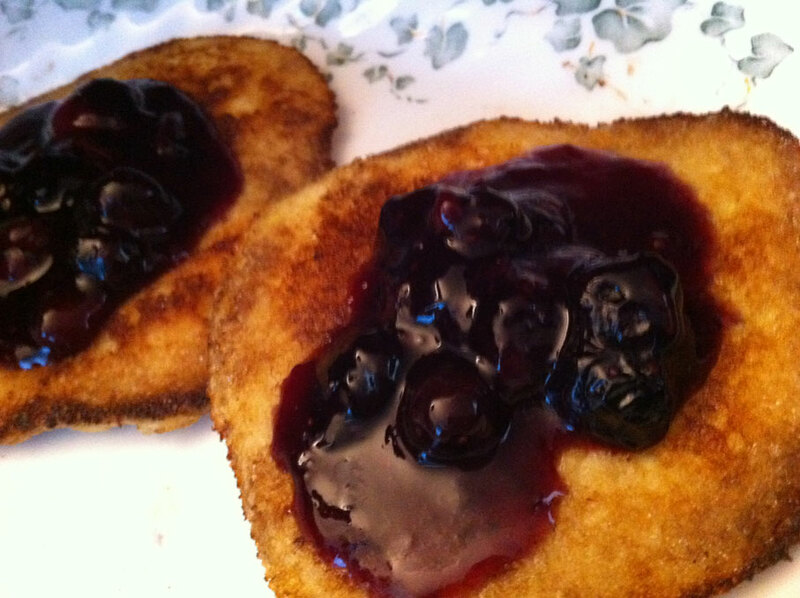 This entry was posted in altered recipes, Breakfast, Brunch, comfort food, comparisons, dinner, Lunch, nutritional values, recipe, stove-top and tagged almond flour, blueberries, cornstarch, eggs, pancakes, Stevia, vanilla extract. Bookmark the permalink.